Washable Keyboards For Medical Professionals. Our Medical Grade Keyboards have set the standard for infection control. 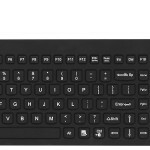 Learn about the 10 requirements for Medical Grade Keyboards here.